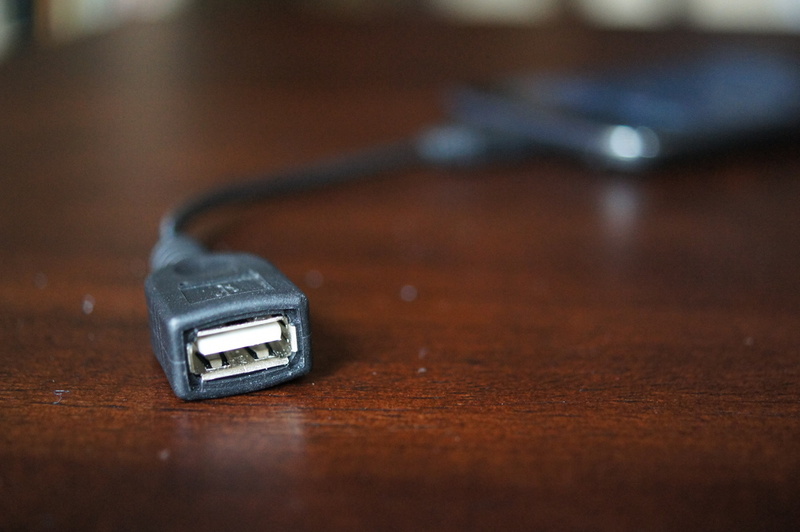 A USB OTG cable, otherwise known as an on-the-go cable, can be used to help expand storage on a device with a limited amount, connect one to a gamepad, or turn your phone or tablet into a mobile workstation with a mouse and keyboard. They are a miracle tool for the mobile tech power user. Some cost as little as a $1, so if you don’t have one, I suggest you pick one up. Well, unless you own or ordered a Nexus 4 from Google. Originally sold as a device with OTG (USB) compatibility, that may no longer be true. 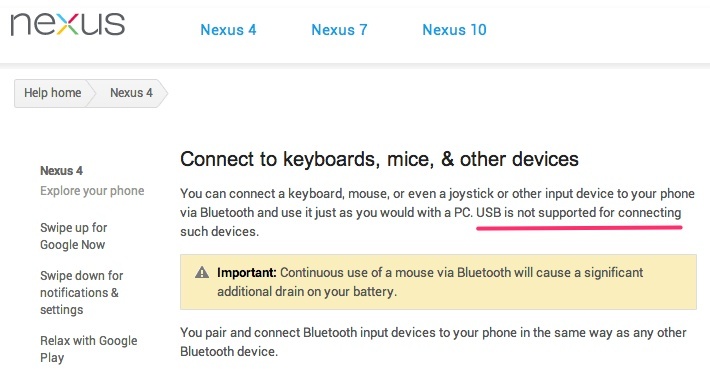 In fact, within the last day, Google updated their Nexus 4 support page titled “Connect to keyboards, mice, & other devices” to say that the device supports Bluetooth connections of 3rd party devices, but not through USB. Two days ago, it said the same thing as the Nexus 7 and Nexus 10 pages, which say, “…to your tablet via USB or Bluetooth and use it just as you would with a PC.” The Galaxy Nexus also supports OTG cables. Theories as to why this change happened are flying all over internet forums. Some suggest that the device was supposed to have OTG support, but that the actual USB port on the device can’t produce enough power to run a mouse, keyboard, or gamepad. Others think it’s software related, and that an update to the OS could provide support down the road. I don’t know that we’ve heard an official statement from Google, but with the changing of their official support page, I’d say that the future looks grim. I also do not think that Google meant to leave this out, as every other Nexus device certainly supports this type of activity. It’s unfortunate, as I know that many who ordered the device were partially sold on the idea that they could connect external storage on the fly to help ease their concerns over the lack of built-in space.